Nuclear fission is a process in which a heavy nucleus split into two. Most of the actinides nuclei (plutonium, uranium, curium, etc) fission asymmetrically with one big fragment and one small. Empirically, the heavy fragment presents on average a xenon element (with charge number Z=54) independently from the initial fissioning nucleus. To understand the mechanism that determines the number of protons and neutrons in each of the two fragments has been a longstanding puzzle. It was expected that the deformation of the fragments could play a role. Indeed, the atomic nuclei can have different shapes depending on their internal structure. Some of them are spherical, most of them are deformed like a rugby ball and a few have a pear-shaped deformation. The internal structure of the nuclei varies as a function of the number of protons and neutrons composing the nuclei. To describe dynamically the fission process, the state of the art of nuclear theory has been used by Guillaume Scamps (University of Tsukuba) and Cédric Simenel (Australian National University). This simulation of the nuclear fission uses the quantum-mechanics to takes into account the motion of the nucleons in the nuclei and uses adequate simplifications to solve the many-body problem. Using that model, in the case of the 240Pu, it has been found that the fission fragments are preferably formed with a pear-shaped deformation (see figure). This pear-shaped deformation is due to the strong Coulomb repulsion of the two fragments. This initial deformation favours nuclei which are pear-shaped in their ground state. This is the case of the Xenon due to some internal structure effects associated with a number of proton Z=54. This mechanism is strong enough to strongly influence the partition of nucleons in several fissioning systems. This mechanism has been found in simulations of the fission of 230Th, 234U, 236U, 246Cm and 250Cf in agreement with the experimental observations. 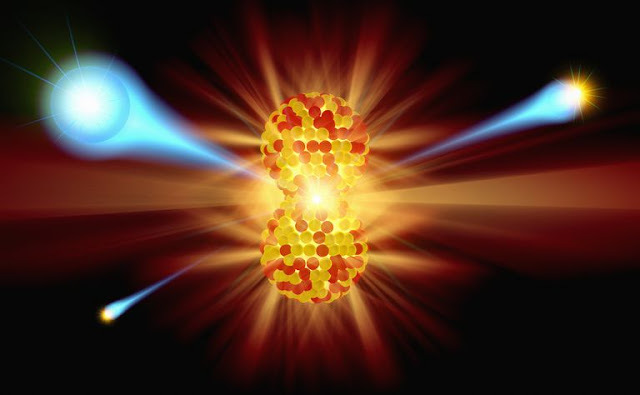 These findings may explain in future, surprising recent observations of asymmetric fission of lighter than lead nuclei, and improve predictions of fission properties of exotic nuclei which impact the abundance of elements produced in the astrophysical processes.